Written by Guest post on Wednesday, 14 January 2015. Glenda bishopWe all love a BBQ in summer but they're often meat-heavy and that's not good; what's more the salads on offer are usually those starch laden potato and pasta jobs - also not that healthy. 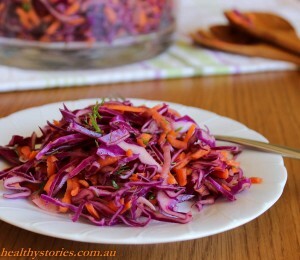 Try this easy to make and decidely yummy and healthy Red Cabbage Salad with Dill and Fennel. I’ve never really liked coleslaw all that much, since it mostly just tastes of mayonnaise-based dressing, but it’s something that people like to serve at BBQs and other ‘bring-a-plate’ type of get togethers. When I was at the farmers' market a couple of weeks ago, they had some really good looking red cabbage quarters for sale and I thought that it was time I worked out how to make a ‘coleslaw’ that was actually fresh and light and not drowned in dressing. As a bonus, cabbage is actually really cheap, which makes this Red Cabbage Salad with Dill and Fennel a great budget recipe. Take a look. Use a food processor to thinly slice the cabbage and then transfer to a very large bowl. Then slice the onion on the thinnest setting on your food processor. Finally, grate the carrot using the coarse shredding disc. Add the carrot and onion to the bowl with the cabbage, and also add the chopped dill. To make the dressing, grind the fennel seeds with a mortar and pestle until they are almost a powder. Tip into a small bowl and add the olive oil, vinegar, and mustard. Mix the dressing well until completely combined and then tip into the bowl with the cabbage mixture. Use your hands to mix the dressing into the cabbage salad and ensure that the ingredients are well combined. Serve as a side salad with meat, fish or protein of your choice. This salad is easiest to make using a food processor, but can be done with a sharp knife and box grater if needed. The flavour of the salad will mature over time and the dill and fennel will be more pronounced if you make it a few hours ahead of time – they are very mild when the salad is first made. The salad will keep for a few days in the fridge and makes good leftovers. P.S. If you're looking for more tasty and healthy salad ideas head over to the salad section of our Foodwatch Recipes here. This salad uses homemade salad dressing - my favourite kind of dressing - to find out why check out my post 6 reasons to make your own salad dressing. And remember - a salad a day keeps the kilos away. Download my fact sheet here. Glenda Bishop is a neuroscientist, registered nutritionist, personal trainer and wellbeing coach. She has a website called Healthy Stories. Q. Can I eat cruciferous vegetables if I've had my thyroid removed OR am taking thyroxin tablets?